The new clip is made of PVC and holds 2" to 2.5" (5 to 6.5 cm) thick lay-in panels. Often these panels are laminated with 0.03" FRP on both sides of insulating foam. Standard, stocked length of 1.25"
Fits on KEELGRID Tee and has "ears" at about 90 degrees which can be riveted to wall. Shown below in a rough picture is the wall clip resting on the wall angle and clipped to a portion of a main runner tee or cross tee. We have developed this new Corner Clip in response to the recent industry trend of mounting KEELGRID as a free hanging system. This free hanging installation is also known as a Cloud Installation. Allows you to use Wall Molding as a grid border without attaching to wall. Creates a 90 degree corner. 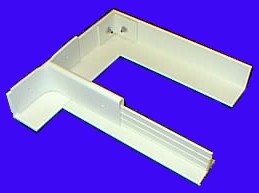 The photo at right shows a typical corner assembly that uses the Corner Clip to tie the Wall Molding pieces together.